The opening size for roll up and garage doors are different than other types of residential doors. They close up against the rough opening, any other type fits inside the opening. 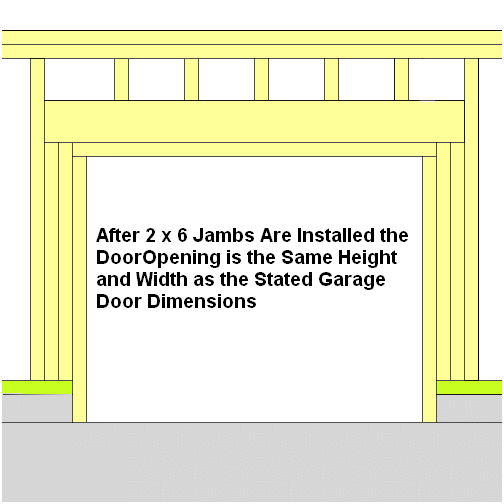 You must decide what type of jamb material is to be used before determining the rough opening for a garage door. By the time the jamb is applied the garage door framing size should be the same as the door. If the door is called a 16′ x 7′ then the opening should be that size. All garage door headers should have double trimmers (cripples) due to their length and amount of weight bearing on them. Adding up the four trimmers and both side jambs plus the width of the door will give you the header length. For a 16′ door the length would be 16′ 9″s. 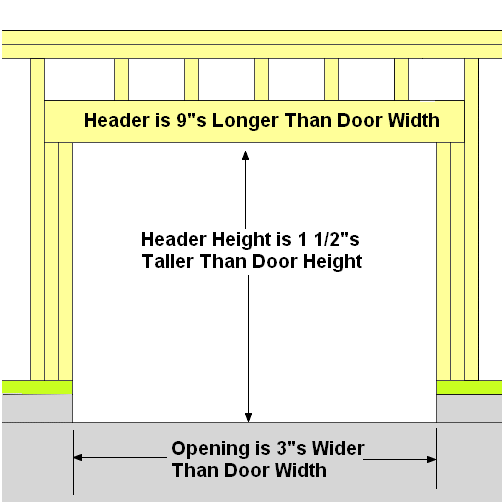 The header height using this method is 1 1/2″s higher than the door, from the concrete floor. Install side and head jambs after the wall is in place. Leave side jambs 1/4″ off concrete floor to prevent moisture wicking and rot. If using 1 x material for side and head jambs, reduce header length and height accordingly. Never use treated lumber for door jambs, it will rust the steel and eats holes in aluminum. Great work and service! Alex showed up on the day I called for service and was done within an hour. He not only addressed my immediate problem but went above on beyond and had my 20 year old garage door working smoothly and quietly again. Thanks again.